I’m Nakisha (working really hard to go by KS Sews in the sew-o-sphere!) of Dressmaking Debacles (@dressmakingdebacles on IG). I learned to sew about five and a half years ago and luckily found the online sewing community very early on. I love the diversity and tone of the Sewcialists blog and was excited to throw my hat in the ring for this month’s theme. Long before I learned to sew, I just loved clothes. I would spend hours (really!) in my closet putting together outfits, trying out different combinations, working on “my look”. I can’t say I’m much into fashion as in, designers or current trends, but I have always aimed for a specific look. I’ve leaned towards a tailored, pulled-together look of a classic style. I entered the corporate world at 21 in a position where I actually had a bit of authority. I was very young (and looked even younger) and it was, at times, difficult to be taken seriously. I sometimes feel that this shaped my early style. As I’ve gotten older my style has evolved from the stuffier side of classic to reflect a more modern take. When I saw the call for contributors I knew immediately who my Sew Style Hero was! For years, I tuned in every Thursday, like clockwork, to watch Scandal. I mean, sure it was an amazing show … but Olivia Pope’s wardrobe!!!! She completely embodies the classic style and the silhouettes, fabrications and small details of her outfits always pop. And if you watched the show, you know ivory is her color! I really wanted to choose someone for my style hero who was sewing related though. And you could definitely see Erica rocking anything in O.P.’s closet, right?! I’m not sure how I initially found Erica Bunker’s blog but I remember being so excited that I did. I was inspired by her style; tailored yet modern, fresh and fun. I was pretty much amazed by everything she sewed. Nearly every post I found myself thinking, “She needs to send that to me!” I cannot begin to tell you how many garments I’ve sewn because of Erica nor how many patterns have jumped the queue due to her posts. I aspired to her skill level very early on. I too wanted to be able to produce garments that looked like I plucked them off of a hanger in an upscale boutique. I watched for new-to-me techniques, finishes, and her expert pairing of fabric and pattern. I have learned so much from Erica over the years and will probably always consider her my Sew Style Hero! I’ve had McCall’s 7780 on the brain since it was released. Initially, I was going to use white linen like the pattern photo. But once I volunteered to contribute here on the Sewcialists blog, I knew it had to be ivory! 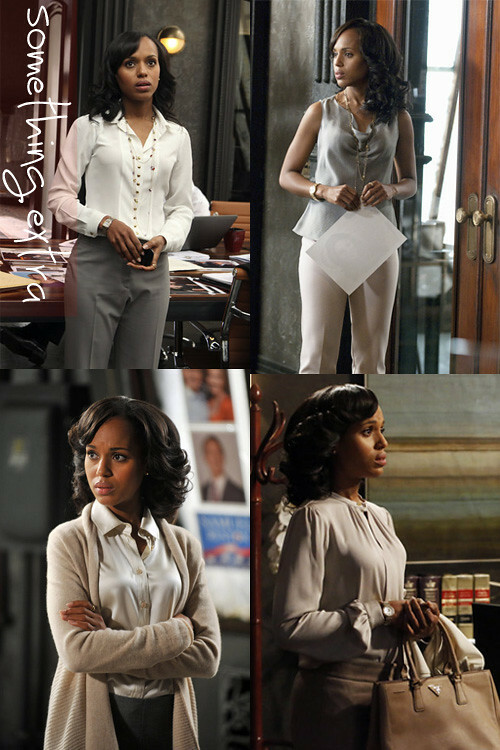 So my new top is inspired by Olivia Pope in color and Erica Bunker in design … with my own personal style thrown in. Thank you for allowing me to share my ramblings 🙂 I hope you will take a moment to think about fellow sewers who inspire YOU to create! Thanks for writing this! I follow your blog (and Erica’s), and I have even watched Scandal. I have to say that you have your style set, and it really works. It’s something I am still figuring out with sewing. It’s nice to be able to make things with fabrics we love instead of being a slave to r.t.w. This series is really making me think more about making clothes that are my style instead of just sewing without a plan. Thank you Natasha! I read something recently that said, everyone has their own style, they’re usually just unable to verbalize it. I had a period where I felt I was unable to define my style but really my life was pushing me in a direction (clothing-wise) that was against my style. Once I left lab work, it all clicked! Definitely think it’s worth it to plan around your wardrobe wants/needs!! Thank you Kisha! I love your sewing and your attention to fit and detail as well! OP has always been “THAT CHICK”! I’ve had a Pinterest board dedicated to her wardrobe since the beginning! What a great post 🙂 I have been following Erica’s blog for a couple of years too – she is an inspiration to many! Your blouse is a perfect rendition of all your describe and looks beautiful on YOU! Thanks for this great post. I sure remember being in your shoes in terms of having to dress for authority at a young age. Like you, as I got older, I was able to infuse some of my own personality into my wardrobe. Now I am of an age that carries authority, but I still find that classic workplace clothing garners respect. Love me a power suit! Exactly that!!! Thank you so much!! Love this! Wonderful post and sense of style. I’m planning on this too soon so I’m happy to see such a great result! Thank you! Ooh I can’t wait to see your version!! How wonderful you found someone who sews your style! I’ve read yours and Erica’s blogs. Love them both. Perfect choice of a garment and color that reflectc both Olivia and Erica! I follow both your blog and Erica’s; you’re such inspiring creators. I can’t tell you how many patterns I’ve realized that I needed after seeing you sew them! Thank you Michelle!! Don’t you just love the sewing community?! Absolutely! Did you see that Erica just made the same pattern?! Love the new top Nakisha! Love both of your style heros too. Erica Bunker is great inspiration for making clothes that look really polished and I love her too. Great post, thanks for sharing. I can definitely relate when it comes to dressing up the part! us short women, I feel, We have to dress a certain way to be taken more seriously especially if we also look younger. Clothes do amazing things for us.